Like you I'm intrigued by these but I'm not sure how it would fit into my garden. Yeah, I think there's a lot that doesn't translate over but there is lots of people doing it here. Stuff just wants to grow here so we don't have many of the problems faced around the world. what a fascinating idea, so clever, I've never heard of one before. But if I had the room I'd definitely have one! It's clever and looked great, like I said it wouldn't work for me in my garden though. they are pretty popular here. i don't have one but they make it so much easier to tend the garden. I like the idea of having ti up high for some people, must make it so much easier to work. Huh. That's really interesting. And you don't turn it? Just add new to the top? Are there worms? No dig is all the rage at the moment. I should imagine there's lots of worms in there somewhere. Thanks so much for all the great Helen's gardens pictures. They have motivated me to do more with my gardens. I loved all the signage on the slate pieces. And no, I've never done a key hole garden but I did fill three old well tiles (24 in diameter) with compost last year and planted gladiolas in them this year. They are growing fantastically! The garden there is great. I really enjoyed it as I got an hours tour at the end of the Sunday. We have a key hole garden built for us five years ago by a wwoofer. 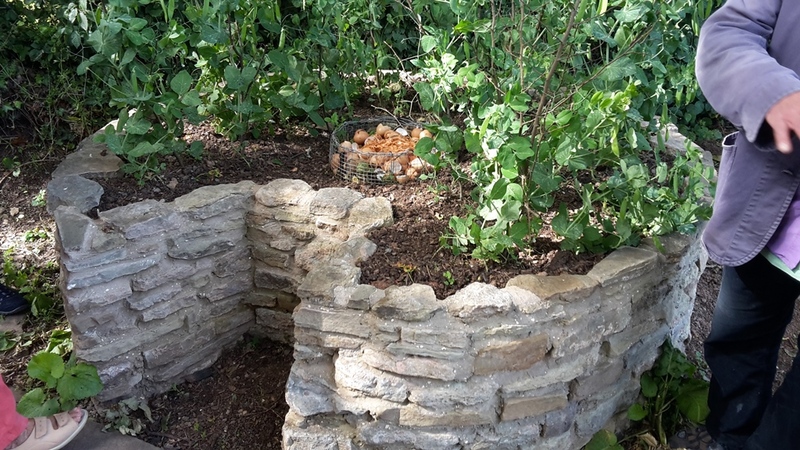 It's great, the stones hold heat in but also protect plants from frost. Ours is about twelve feet diameter, and a great height to work, we find we get twice a good a harvest from it than we would from one of our flat beds. Sounds great, I also like the sound of using the wwoofer to build it! Maybe I should look into getting volunteers here! Yours sounds a great size! There's also helpx Kev, we find the helpx'ers better than wwoofers nowadays. I suppose a key hole garden is a raised bed by any other name & could be made with wood instead of stone. I especially like the idea of the compost heap in the middle - free-standing compost bins are such an eye-sore in a very small garden & this puts it to great use while out of sight. These could also be used in a small front garden to use kitchen waste & grow bee-friendly plants. Yeah, it's a great way of hiding th ecompost. That said mine are yard by a yeard and a half square and I fill on in under a month in the summer easily so it would need to be pretty big in the middle for me! Great in a front garden like you said. I'm a big fan of the grown food not lawns. I've been altering my front garden to be more productive so watch this space! Can't see it! Not sure where I ave to log in. you should be able to see it now? I've been thinking about using this concept. Only thing is I want to buy prefabricated raised beds and then all come in standard shapes. I definitely want to have a compost bin in the middle though, even if its a long narrow raised bed.